Are you a beginner to SQL? 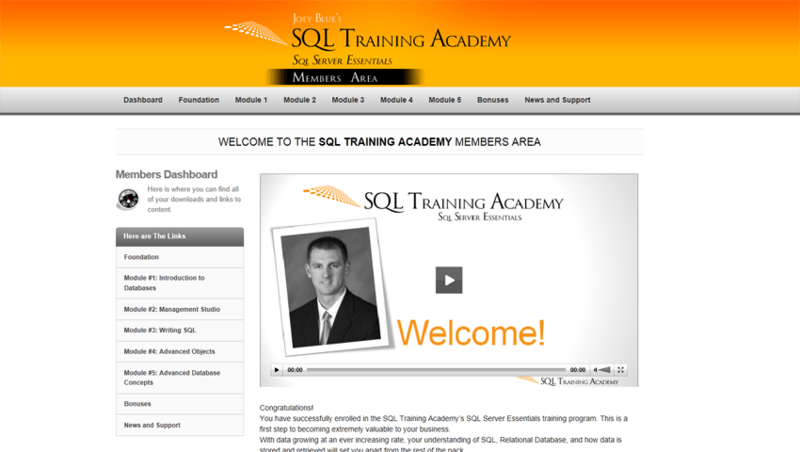 Start with my one hour SQL video for beginners. Description: Learn SQL Server from the ground up. No prior database knowledge needed. Instant Access! Description: Learn to create custom reports, charts, and invoices. No prior knowledge needed. Instant Access! Description: Learn how a SQL Query is written. Videos demonstrating how you retrieve data from SQL Server. 100% Free! Instant Access! Description: Learn 3 different ways to move data from Microsoft Excel to SQL Server. 100% Free! Instant Access! I really liked the program, I went to school for Computer Networking 15 years ago and had no experience in SQL. Joey really explains how to use SQL so anyone can follow along. I had absolutely no prior knowledge of SQL Databases before taking this course and was worried that it was going to be extremely complicated to learn, I was wrong!! The instructor is easy to understand, has a great coaching voice and style and learns you all steps involved for creating and managing SQL databases. Thanks for the great course Joey! !